This talk will introduce you to both beach and mountain dwellers among Kaikoura’s marine birdlife: the Banded dotterel (Charadrius bicinctus) and the Hutton’s shearwater (Puffinus huttoni). We will outline the challenges these species face as well as conservation efforts undertaken. Inhabiting quite different ecological niches, both species are or have been under severe pressure due to introduced predators. While successful mitigation measures have been implemented for Hutton’s shearwater, leading to stabilisation if not increase in population numbers, the severity of the issue is only becoming apparent for Banded dotterel attempting to breed on South Bay beach. Current strategies to control this will be discussed. Furthermore, we will touch on factors impacting on bird populations which are completely out of our control: Earthquakes. 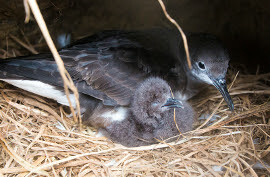 While Banded dotterel gained foraging habitat due to risen sea floors and increased tidal areas along the coast, Hutton’s shearwater suffered significant habitat loss at their breeding colonies in the mountains due to rock slips and collapsed burrows. Timing of these events had it that in addition many lives of adult breeders were lost in the process. This is a story of loss and hope and the dedication of those who care. All welcome. Supper and a chat afterwards.